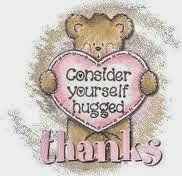 Hope you are all well this morning but if you're feeling poorly I do hope you feel better soon. It was a gorgeous summer day yesterday but unfortunately today we're back to grey skies and rain is forecast. This is my last post for Moving Along with the Times and today I'm hosting the challenge. I chose the theme of Snow Cute in the hope that some of our challengers will don their thinking caps to make their first Christmas card of the year. 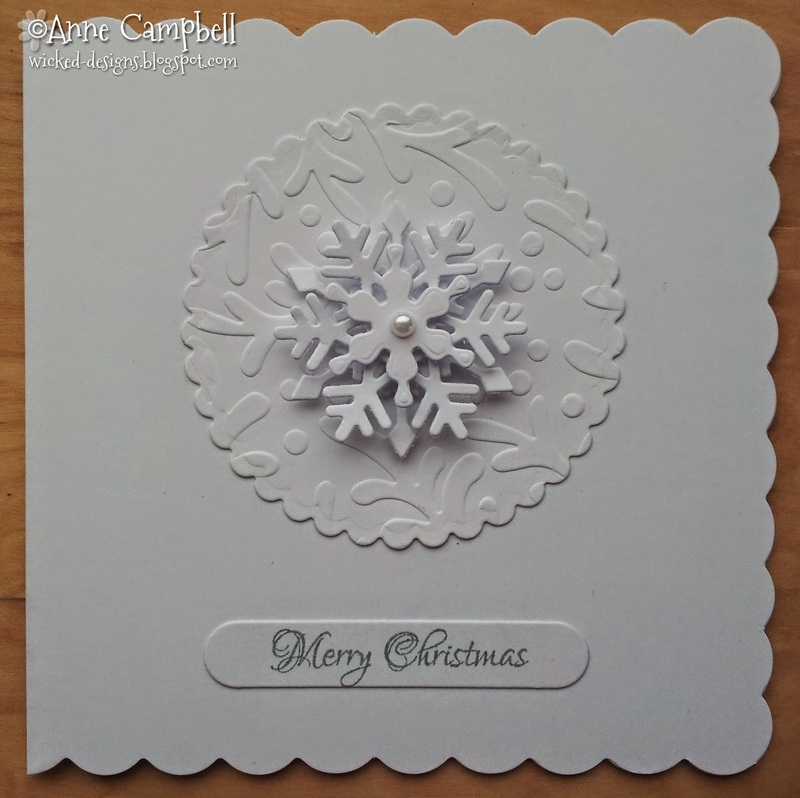 I'm a lucky girl as my Christmas card box is full to overflowing which is just as well as I won't be making any more. The sale of my crafty stuff has gone well but there is still a bit left so it will be getting popped onto Ebay at the weekend. Two boxes of paper and card went to a good home yesterday. One of my friends SIL runs Beavers so I'm sure they will manage to put it to good use. 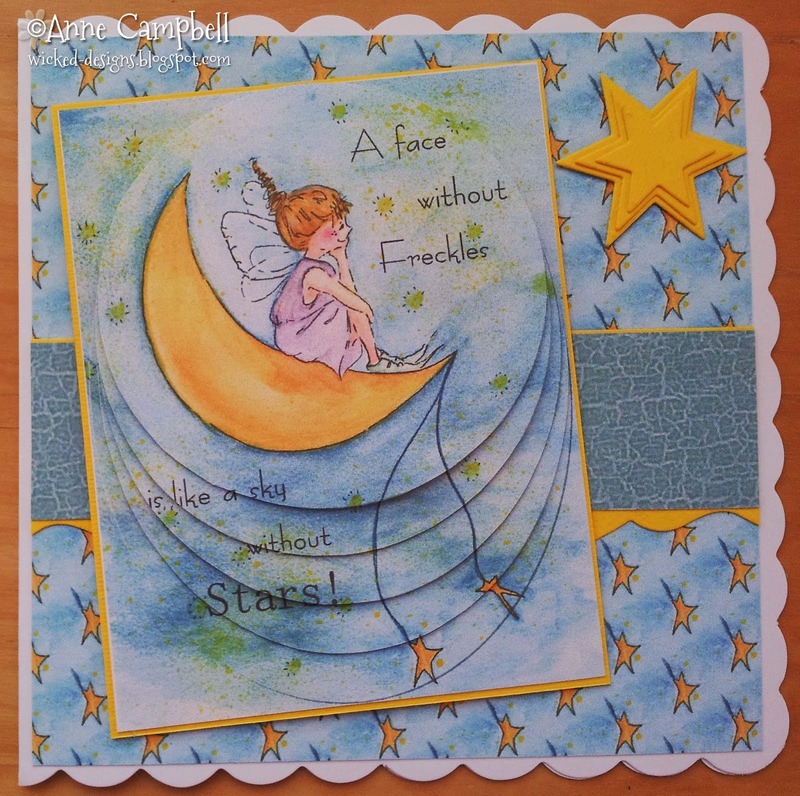 My last card has been crafted and my last blog posted. I am still going to pop in and out of blogland though to keep in touch with my blogging buddies so I'll say Au Revoir for now and see you around. 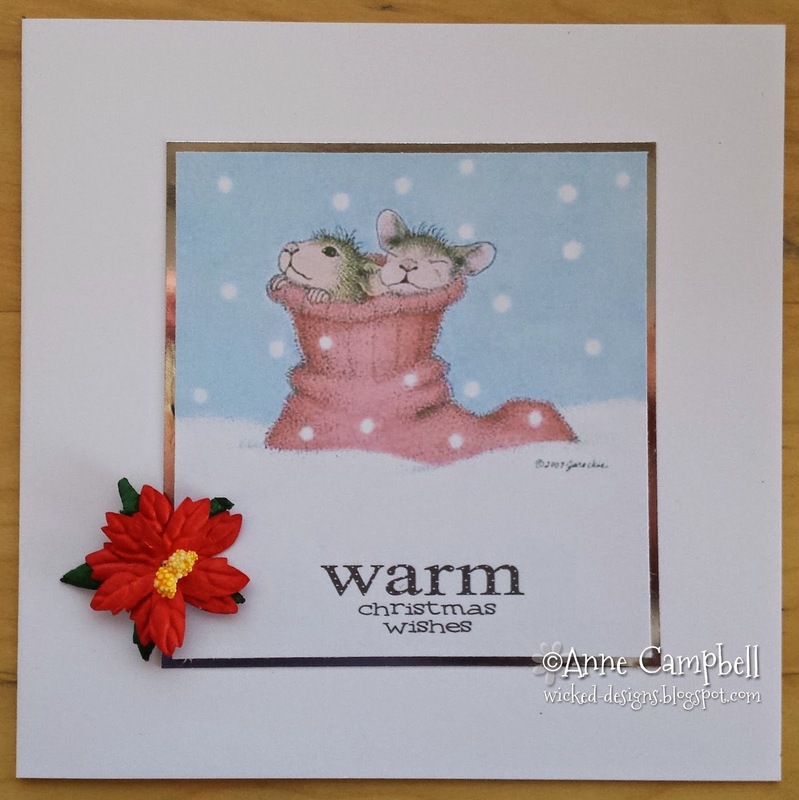 This is my last challenge post for Holly Jolly and the theme of Anything but a Card has been chosen by Judy. A big thank you to Cindy for having me on the DT and to all the girls for their friendship. Although I won't be crafting I'll still be popping in to see what's going on. Waiting for Mr Tesco to come with my shopping then I'm meeting my daughter in her lunch hour. Her office is just along the road from our M&S Food so we go in there for a sandwich and a blether. 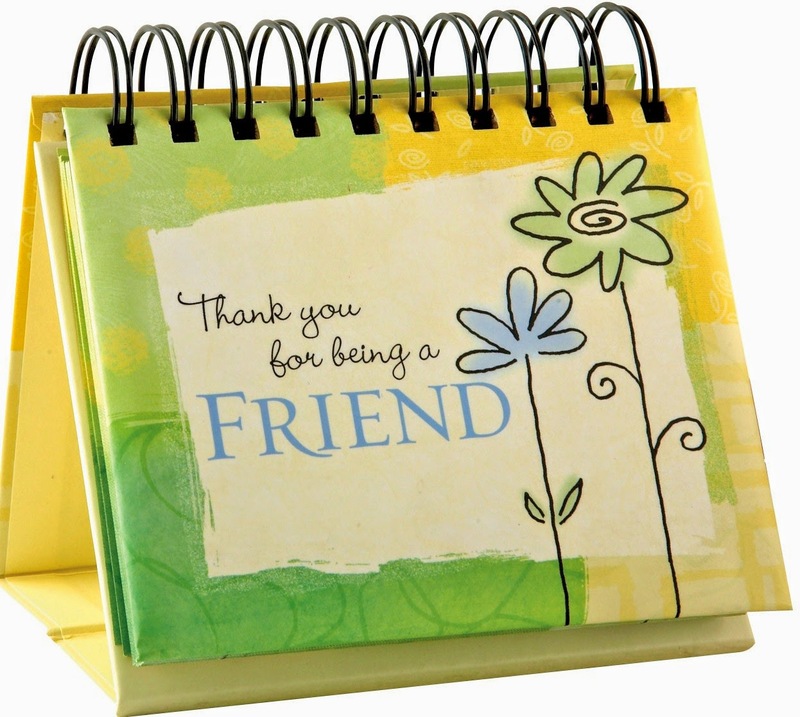 Hi to everyone who pops into my wee space on the web and leaves comments, gains inspiration or just has a nosey. The time has come to pack up the craft room for good. I've done this before and in hindsight should never have come back! I have boxes of cards that I've made since returning from the last meltdown. They are gathering dust and I've no outlet for them so why am I doing it? Mr Mojo left the building a long time ago and emigrated! I have stepped down from all my DTs but still have one more challenge to do. I'm hosting this week's challenge at MAWTT and that's it! Just because I'm not going to be crafting any more doesn't mean I'm not interested in what you all make so I'll still be popping in and out. 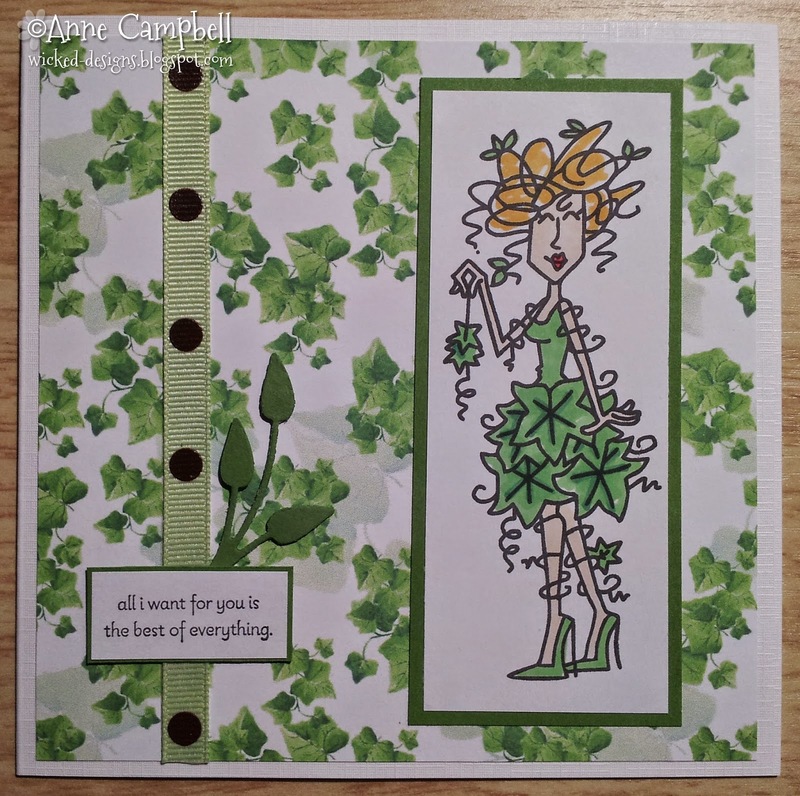 I'm still going to run the Ooh La La Creations challenge blog and I'm also still doing the Sunday Challenges for Paper Playful so I will see you around in blogland. 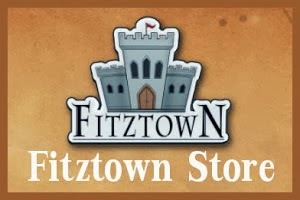 Off now to post the sale page which you will find here. Thanks to everyone who has shared my ups and downs, kept me sane and generally made my life happier by being in it. Ooooh, I'm late on the go today. The craft room has been super busy most of the week (next post you'll see why). This is my last challenge with the Christmas Card girls. I've decided to step down from all of my DTs as I just don't have the time to spend on card making. 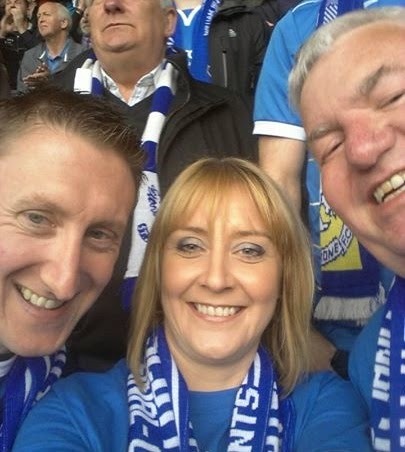 The family had the most wonderful day out at The Scottish Cup Final in Glasgow yesterday and it was made even more enjoyable as our team won ... the first time in their 130 year history that they've made it to the cup and they won! Woopee!!! 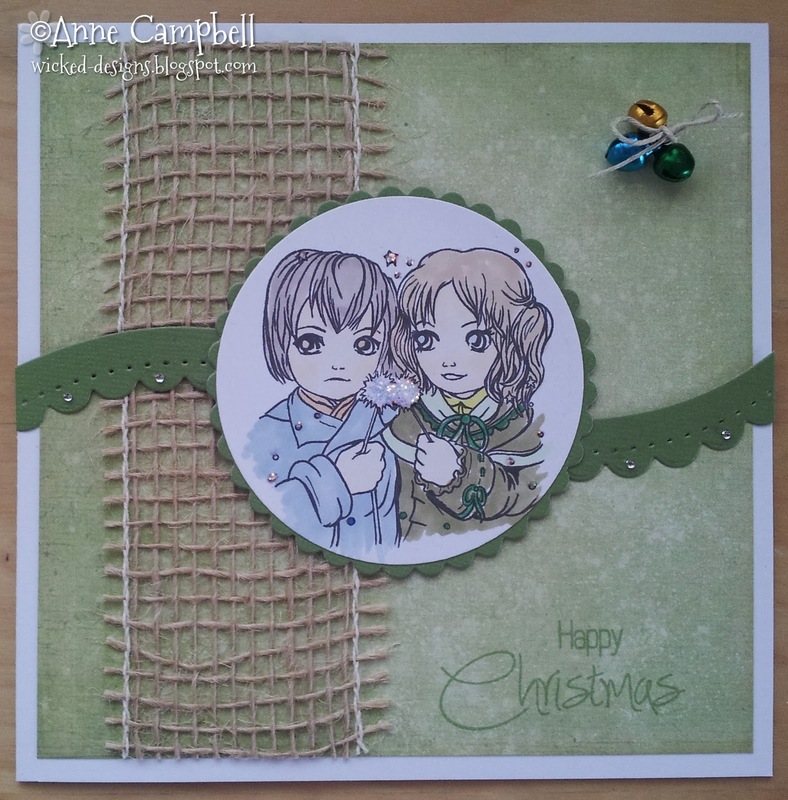 Here is the card I made for my last challenge with the Christmas Card Challenge. Off now to get the vacuum out, I've spilt UTEE all over the floor .... grrr! 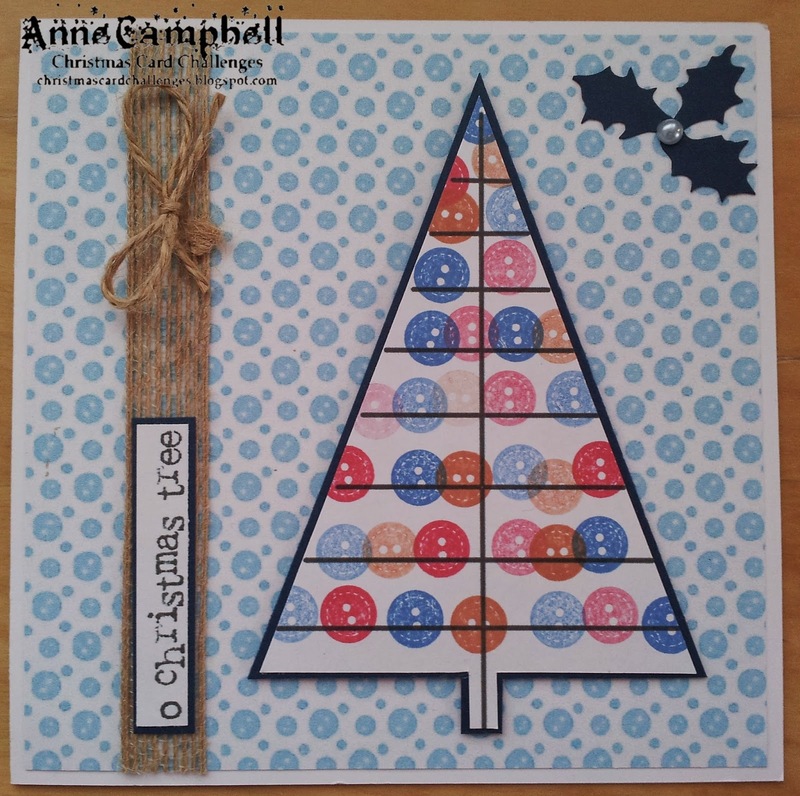 Image - Tree by Birds Cards stamped with Button from Best of Everything by Stampin Up! Paper - didn't keep a note of it and I can't find it again! I thought summer had arrived yesterday as we'd a brilliant day but unfortunately today normal weather has resumed. 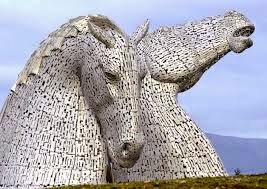 My Aunt and I went to Helix Park, Falkirk to see the Kelpies. Wow, they are truly stunning and even more beautiful with the sun shining on them. 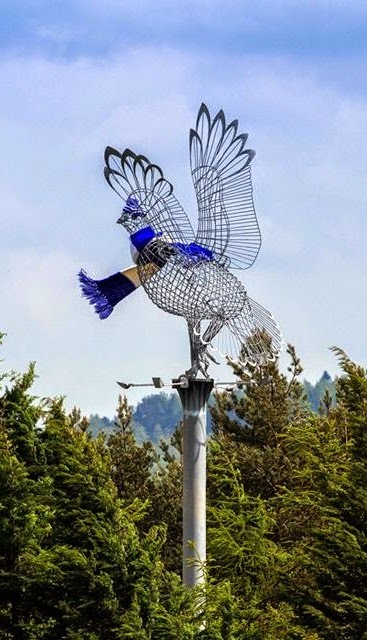 All my family, except myself and granddaughter, are off to Glasgow today to the Scottish Cup Final as our local team, St Johnstone, is one of the teams playing. They have never reached this stage in the cup before so fingers crossed they triumph as winners. The city has really embraced the excitement and have decorated a roundabout, near our home, with scrarves. 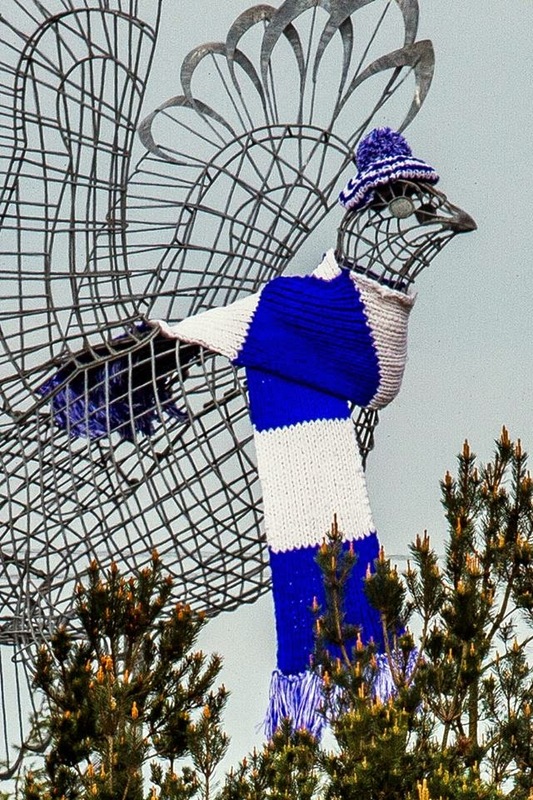 All the trees have a scarf tied round them and the Grouse in the middle of the roundabout even has a tammy too! 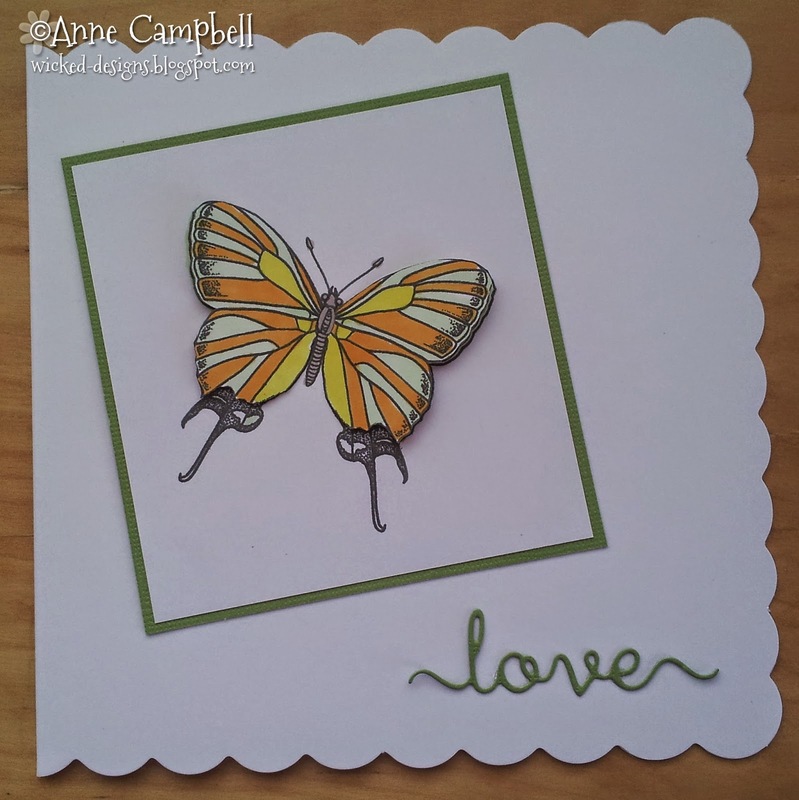 Last, but by no means least, my Clean and Simple card for the latest challenge over a Suzy Bee's. Off now to put the kettle on in readiness for our daughter arriving. She's driving with Mr C through to her brother's house in Callander and then they're all off together to Glasgow. My son's friend and his wife are even coming from New York for the match! Enjoy your day whatever you're up to. Hope you are all well this morning. I've scheduled this post as getting up to do it at 5am (UK time) is just way too early for me! 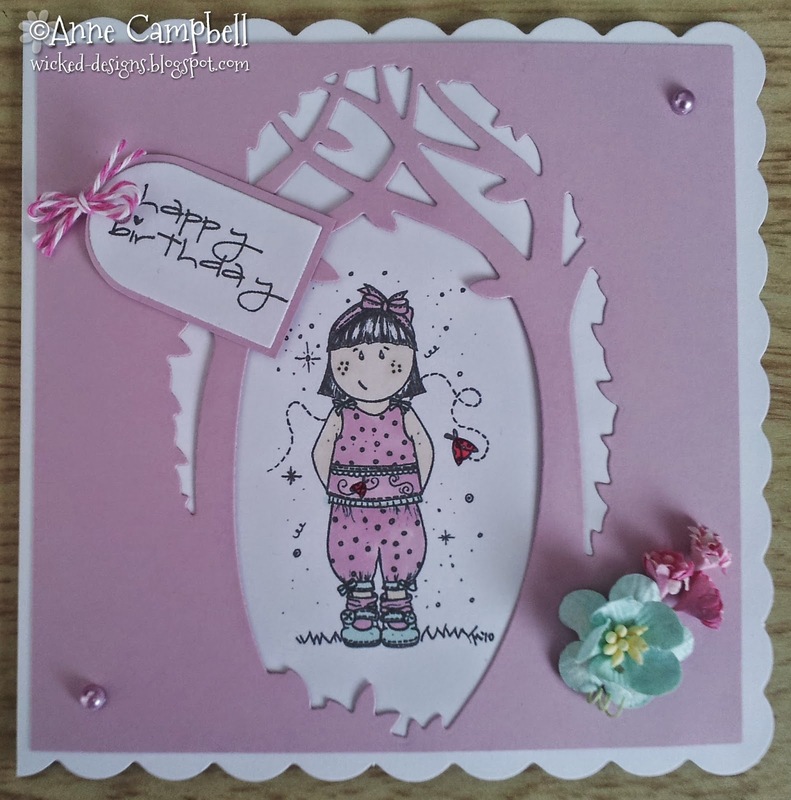 I just take part in DT stuff with Ooh La La Creations when I have time but this challenge was a MUST! Wendi and Emma have a new CD coming out soon called Say It With Words and DT Wendy picked the theme of quotations which fell into line just beautifully. 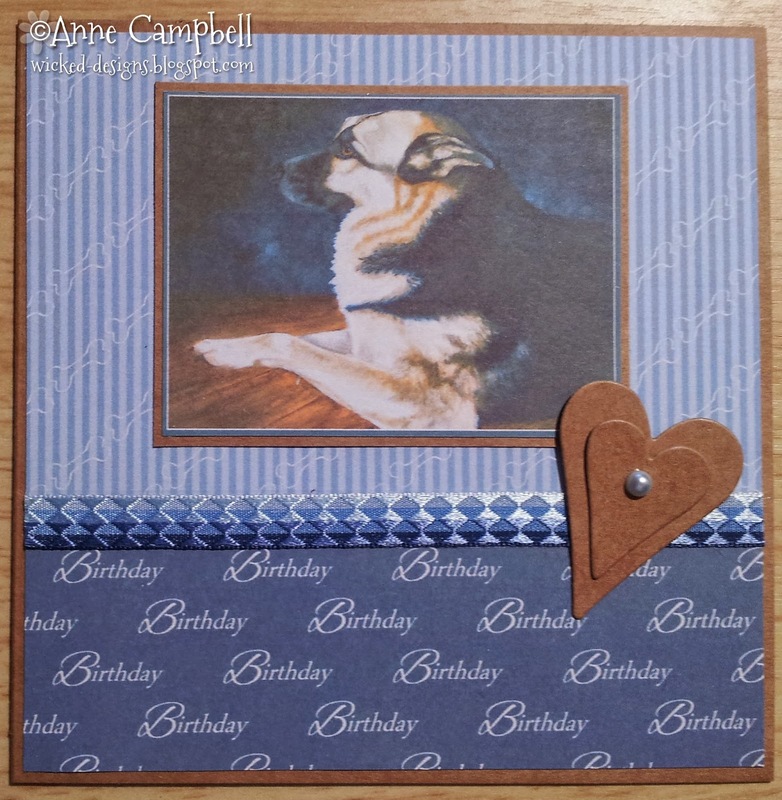 The artwork and quotations on the CD are brilliant and when making cards the designs almost put themselves together. Stay tuned as it launches on Create and Craft on 9 June at 3pm (GMT). 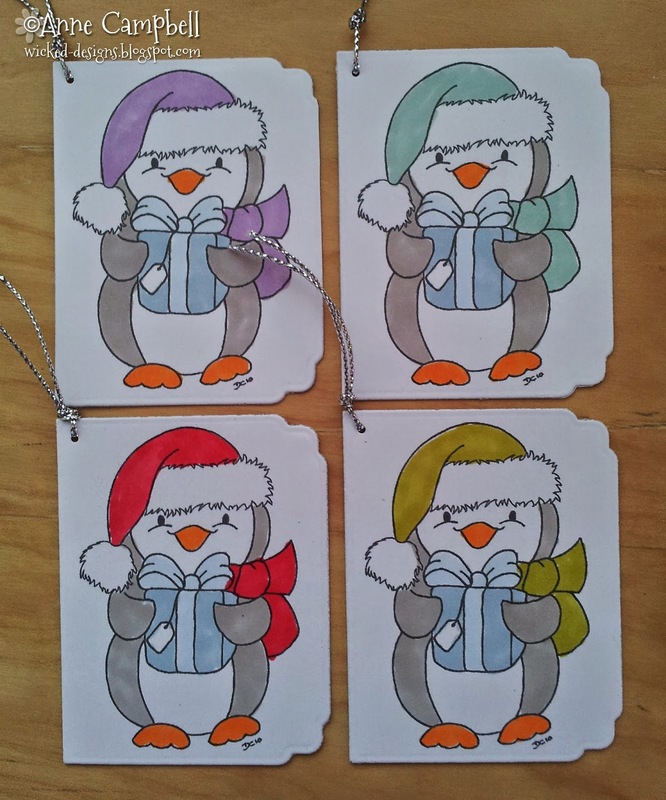 Anyway, the card I've made is a sneaky peek! 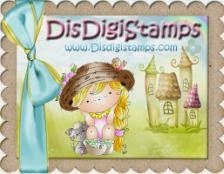 Hope you like it and check out the other DT Divas as there are more sneaky ones there! Wowser, Sunday has whizzed around again and we are now almost in the middle of May. I tell you, it WILL soon be Christmas .... groan! Join in with our challenges and you'll soon have a nice stash of cards ready for the big day. Not sure what's going on in our household today. Ideally I'd like a day in the craft room to catch up on DT work instead of constantly chasing my tail, time will tell! What are you up to today? I'm meeting up with my daughter. We haven't had a good catch up for a while so over lunch we will put the world to rights. Enjoy your Saturday whatever you're doing. 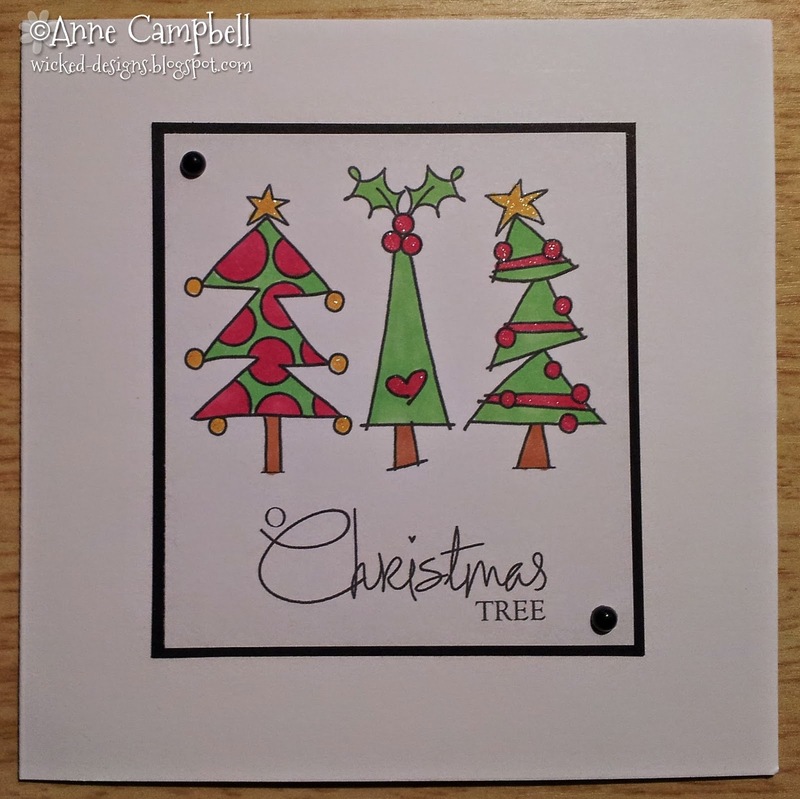 Sentiment - Best of Everything by Stampin Up! Chasing my tail as I always seem to be these days! A gorgeous day here so some washing is about to be loaded into the machine. The other day I had bedding on the line and Mr C said "your washing's lying on the ground". Thinking something had escaped it's pegs I went outside only to find that the whirly pole had snapped in two. With Mr C holding it upright and me rescuing the washing the poor old whirly was consigned to the bin! I now have a nice shiny new one so today might just be its inauguration! Our granddaughter is on study leave just now so I'm taking her out for lunch. She can't study all the time and deserves a wee break. That's two down and her next one isn't till next Friday. Ooooh, even though it's a very long time since I sat my O Levels and Highers it still brings back memories ... not all good!!! Sunday again, the weeks are passing by at an alarming rate! It was a lovely day yesterday in my little corner of the world and after getting caught up with the housework and ironing Mr C and I spent the afternoon in the garden. The grass is growing like wildfire ... as are the weeds! The garden is looking good again, it just takes a wee while to lick it into shape after winter. 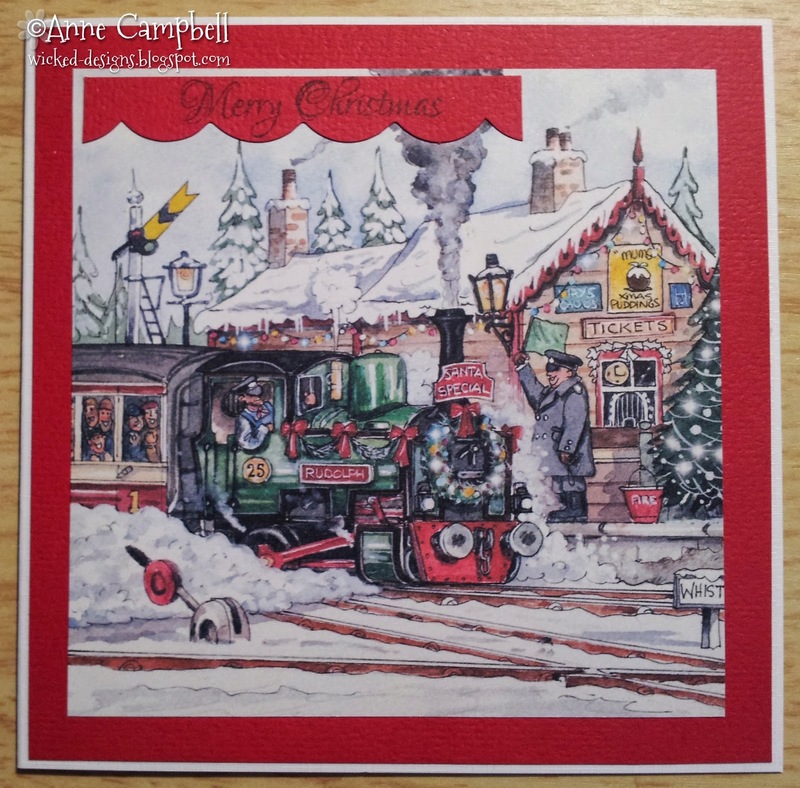 It's time for another Christmas Card challenge and this time there's to be no embellies. Now even for me, the clean and simple type, that's quite difficult but I think I've nailed it with this card. Enjoy your Sunday whatever you're up to. Firstly, a very big thank you to all my blogging friends and commenters, you make crafting worthwhile and I don't say often enough how much I appreciate your visits. On now to this week's challenge at Suzy Bee's. It's any Anything Goes so please join in! Today is going to be a catch-up day ... more ironing, washing, housework and hopefully I'll manage to squeeze in some baking. It's been all play this week and today's the day it's caught up with me! Not to worry, I've got tomorrow to look forward to, an afternoon with Mr C and our son and DIL. It might be an afternoon of work mind you as they had trees cut down last night and they've all to be chopped up and stored, ready for using next winter ... or the one after that! Mr C has to take bags with him and we're getting a load of wood to bring home for our store. I know there'll be a delicious meal at the end of it too! If you're up when this is posted at 5am you're either mad, an insomniac, in another time zone or getting ready for work. Me ... I'm asleep! If you're wondering where my embossing is, look closely at the diecut in the middle and you'll see the little embossed dots. Hope you are all well and raring to start another week. 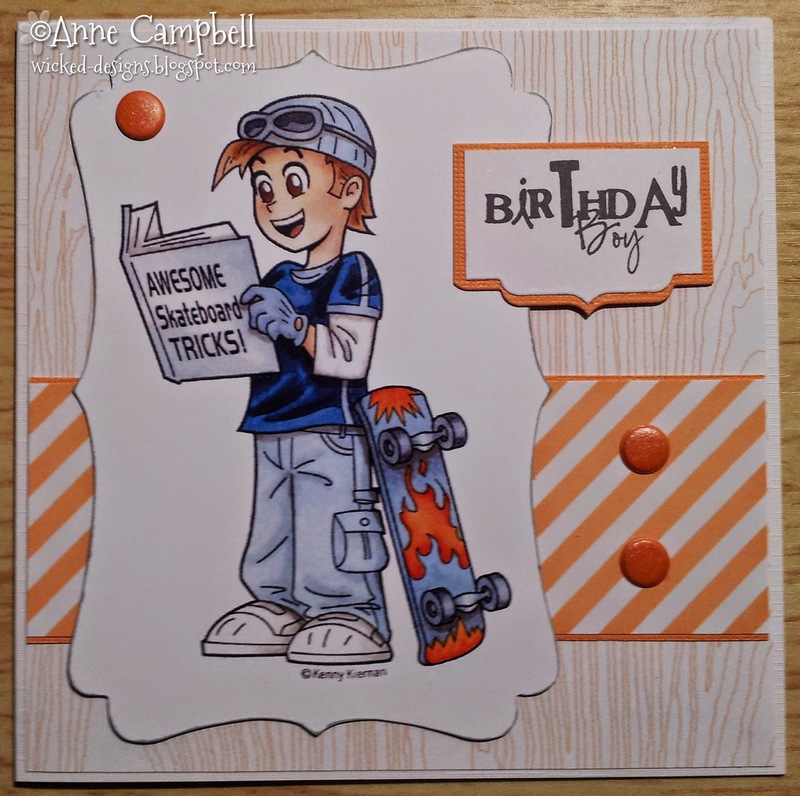 Some of you may know that I run the OLL challenge blog but Wendi gave me special dispensation to only design a card when I could. Well, this fortnight I could cos I love the Faithful Friends CD (and all the others produced by OLL!!!) 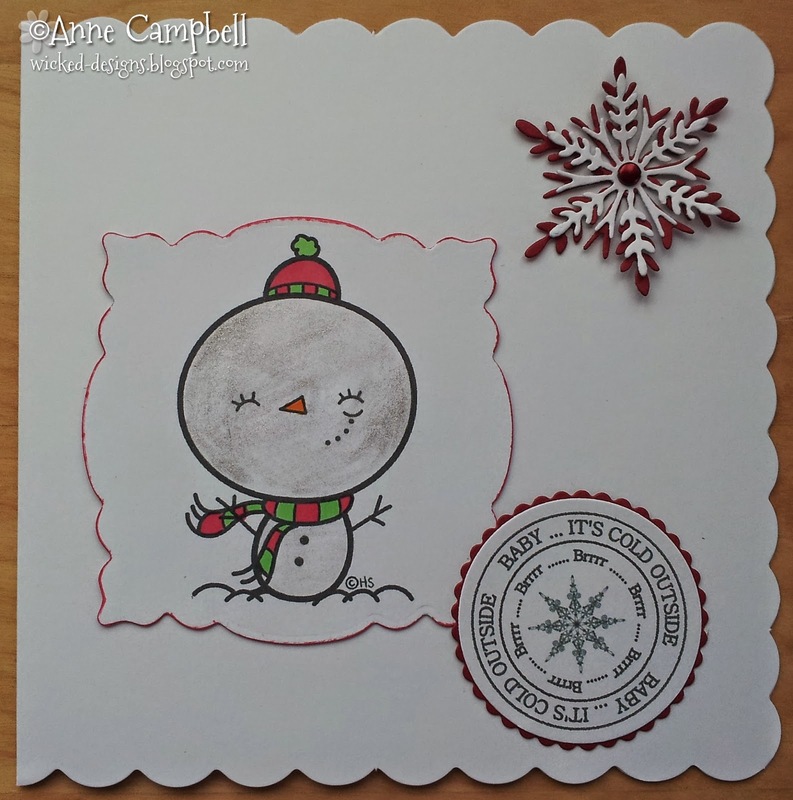 Why don't you pop on over to the blog and join in the fun with the talented DT. Housework and ironing on the agenda today, boohoo! Oooops, this post was still sitting on Draft instead of me changing it to Schedule. Not to worry, got there now. I have a voucher for Afternoon Tea at one of the local restaurants and thought Mr C would come with me this afternoon but he said he'd rather not as all the sandwiches would have lettuce on them and it's something he just hates! Instead my pal and I are going so I'm off now to get organised. I'm really chasing my tail this morning. 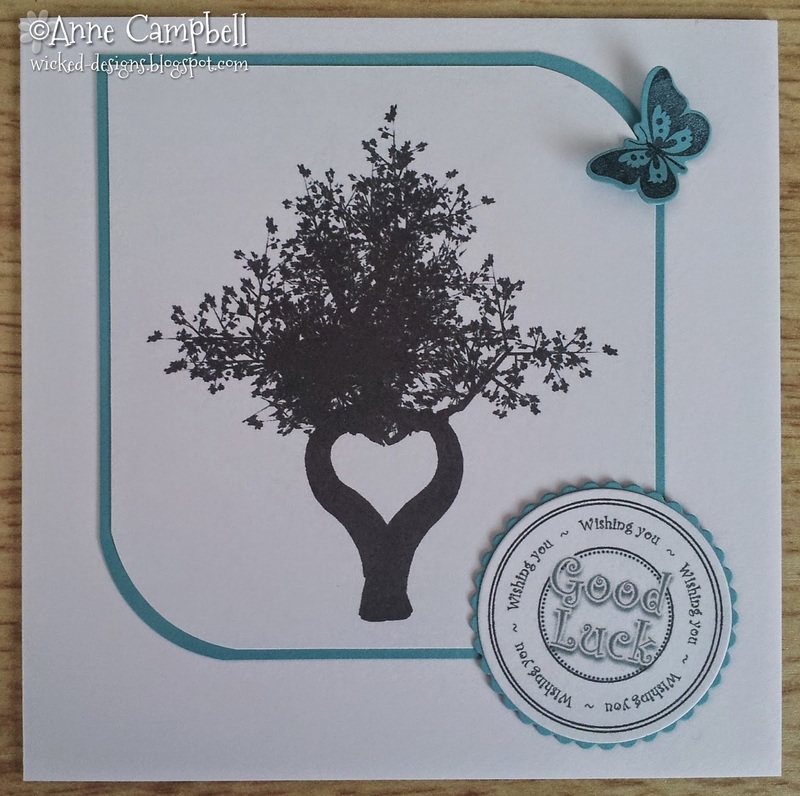 I completely missed making a card for this challenge so it was up with the lark and get one made! I'm quite pleased with it in the long run ... my usual CAS! Granddaughter stayed over last night so I'd better go and see if she's awake and get her home to get her work clothes before 12. Good morning ... well I hope it is as I'm still asleep in bed and Mr Blogger is posting this for me! 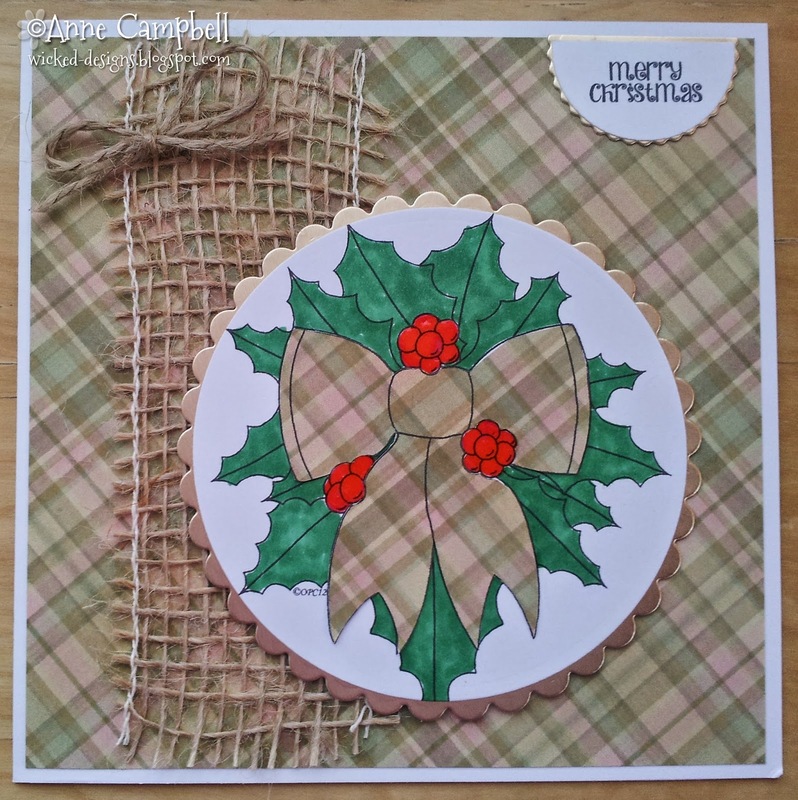 Time once again for a Holly Jolly challenge and another card for the Christmas box! 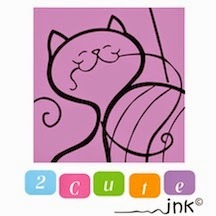 Mr C is doing an extra shift today, starting at 0800 so I'm going to have a crafty day as he's not finished until 1600. If my bestest buddie's hubby is watching footie or rugby on TV this afternoon she's going to pop in to make some jewellery with me ... and have a natter and a cuppa!! !